Minister Katherine Zappone is an Independent member of Dail Éireann and a former Independent Senator (2011-2015). Dr. Katherine Zappone has spent her life campaigning for social justice and human rights. Dr. Zappone was a commissioner with the Irish Human Rights Commission (2002-2012) and has held leadership positions in the NWCI and the Centre for Progressive Change. She is co-founder of An Cosán, Ireland’s largest community education organisation, with her spouse Dr Ann Louise Gilligan. An Cosán’s mission is to combat inter-generational poverty through education and training and supports over 1,000 families annually. An Cosán also runs early childhood education and care facility Rainbow House and Fledglings social enterprise, which operates eight community pre-schools around the country. Since entering politics in 2011 she has been a leading advocate for political reform, equality in education, financial justice and gender equality. 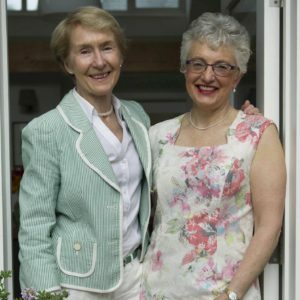 Katherine Zappone and her spouse Dr. Ann Louise Gilligan campaigned to have their September 2003 Canadian marriage recognized by the Irish State for over a decade. They are co-founders of Marriage Equality and both worked tirelessly in the successful Referendum in 2015 on the issue. Minister Zappone holds a PhD from Boston College, an MBA from the Smurfit Business School and an Honorary Doctorate of Laws from UCD School of Law.